In terms of Yellowstone lodging, the current Old Faithful Snow Lodge is rather recent. Indeed, for a long while, it was the newest hotel in the Park (that designation now belongs to the new Canyon Lodges). But its construction really signaled a new shift in Yellowstone lodging. To understand this, we’ll have to go back to the original snow lodge in Yellowstone. In terms of accommodations, the former Old Faithful Snow Lodge was not high on anyone’s list of favorites. First opened in 1957, the building served multiple functions (registrations office, dining room, employee housing on the second floor). In 1971-72, the building was opened for use during the winter. In fact, business went so well, buoyed by skiiers and snowmobilers hungry for powder, that the company constructed 24 new cabin units between 1973 and 1974 to meet demand. With more and more visitors coming to the Park in winter, however, it became clear the facility would not be up to snuff. As such, the old Snow Lodge was torn down in 1998. Work began later that year on the new Lodge building, based off designs by A&E Architect of Billings, Montana, and funded by the National Park Service and Amfac Parks & Resorts (present-day Xanterra). It was built in multiple phases, with the first half opening July 1998. The second half opened May 1999. Reflecting Yellowstone’s commitment to recycling, all of the pine and cedar heavy timbers used in the new Old Faithful Snow Lodge came from older buildings facing the wrecking ball. In fact, timbers used for the porte cochere came from a dismantled sawmill owned by Aloha Lumber Company out of Pacific Beach, Wash. Aloha supplied lumber and cedar shingles for the original Old Faithful Inn in 1903/04. The new Old Faithful Snow Lodge was designed by A&E Architects of Billings, Mont. The general contractor is Groathouse Construction of Laramie, Wyo. “While maintaining the charm and ambience found in national park lodges constructed in the early part of this century, the lodge offers modern-day comforts and amenities that today’s travelers expect,” said Jim McCaleb, general manager of Yellowstone National Park Lodges. In terms of look and feel, the Old Faithful Snow Lodge is a sort of hybrid between “parkitecture” and more modern facilities. True, the use of wood is prominent (especially in the lobby) and the cedar-shingled roof echoes nearby Old Faithful Inn (itself one of the earliest instances of “parkitecture”), but in truth the facility more closely resembles the old Canyon Hotel. Although far smaller, the Snow Lodge strives for the same sort of rough elegance. 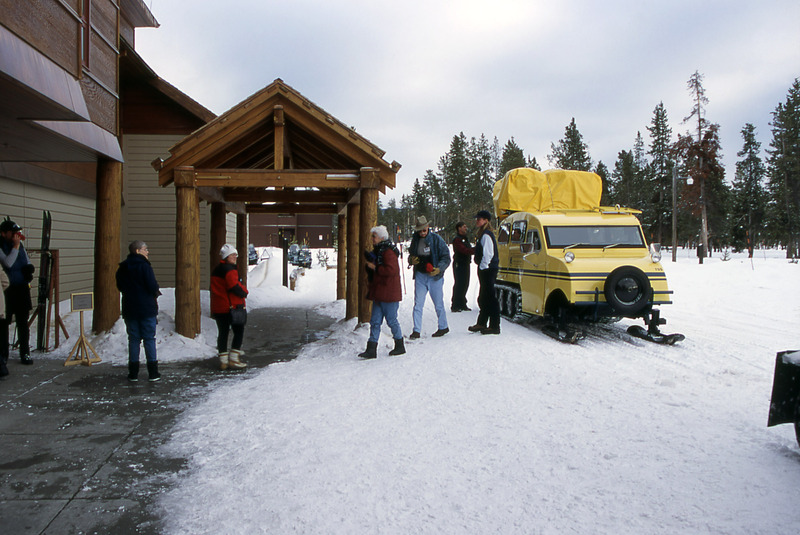 Even if you’re not staying in the Snow Lodge, the building is well worth a visit, whether to grab dinner at the Obsidian Dining Room (or a drink from the Firehole Lounge) or sit in one of the many lounge chairs in the lobby. Some summer nights, it may even be cold enough for a fire.